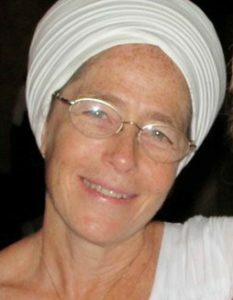 Mata Mandir Kaur Khalsa has been a minister of Sikh Dharma since 1984 and is a Certified Teacher of Kundalini Yoga. She began the JHSD telecourses in 2000. She is a professionally trained pastoral counselor and knows how to create safety and connection in a group. Her compassion, wisdom, and playful style remind us of the deep and loving connections that are possible on our own unique path of spiritual evolution. Her “heartfull” presence fosters an environment that welcomes all questions, viewpoints, and experiences. 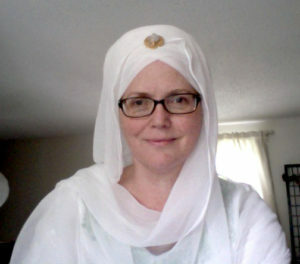 Her knowledge and deep love of Sikh Dharma serve to inform and inspire her students. Mata Mandir is passionately committed to facilitating connection and spiritual growth, both in the class and in her life. It has been her good fortune to live in the thriving Guru Ram Das Ashram community in Herndon, VA, for over 40 years, and counts among her most precious blessings the opportunity to be a part of Raj Khalsa Gurdwara, which brings together Western and Eastern Sikhs and seekers to enjoy the delights of sangat, kirtan, seva, and prayer in the Guru’s court. Her marriage to GuruGanesha Singh fills her life with beauty, growth, and fun, and she adores her children, Saraswati Kaur and Akal Sahai Singh, and her 3 precious granddaughters and soon-to-be-born grandson. Mata Mandir loves playing and listening to kirtan, walking in nature, and swimming in the ocean. Working with Mata Mandir is a journey of self-discovery and transformation. Dr. Sukhmani Kaur Khalsa is pleased and privileged to act as Mata Mandir Kaur’s back-up facilitator as needed. Journey into the Heart of Sikh Dharma was a deeply beautiful and meaning experience for her and she is so blessed to have the opportunity to serve the Guru through serving the Journey. Sukhmani Kaur lives in Ann Arbor, Michigan, where she is the Director of Music Therapy at Eastern Michigan University. She has lived and loved our beloved Dharma for many lifetimes, but in the present, she has been a part of Sikhi for the past 16 years. Some of her story is narrated in Sikh Spiritual Practice: The Sound Way to God by Siri Kirpal Kaur Khalsa. Learn more about the JHSD team.